Those giant futuristic monster truck/buggy hybrids are back again in Rollcage Stage 2. We covered the first Rollcage game back in February and found it worked great on our Windows 7 and Windows 8 machines, bar some issues with configuring controllers. 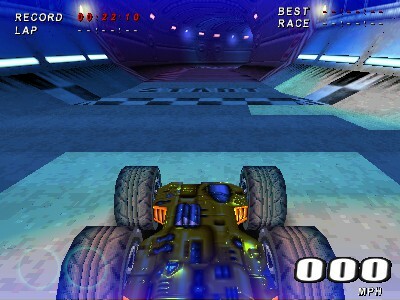 Due to a decision that could only have been made by men in suits sat around a board room table, the game is known as “Death Track Racing” in the US. Stage 2 adds more tracks and gameplay modes over the first game but keeps basically the same formula, inheriting the same controller problems as the first one and curiously adding a new problem for Windows 8 users. 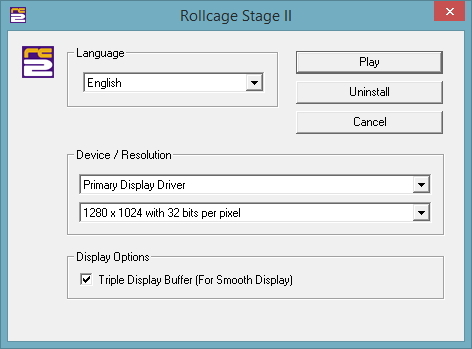 Rollcage Stage 2 installs just fine on modern PCs, simply insert the CD-ROM and follow all the on-screen prompts. If the game does not start to install automatically, browse to the CD-ROM in File Explorer/Windows Explorer and run the “SETUP.EXE” file on the disc. While installing the game, make sure to choose “full installation” and when prompted to install DirectX, skip this step. At the end of the installation the installer will ask if you want to start the game. You should skip this step for now as we need to apply the latest patch first. Before running the game, you should apply the 1.0c Patch. You can download this patch here. Once downloaded, simply double click on the executable file or choose “Open” or “Run” in your browsers download manager. Follow the on-screen prompts and the patch will then be automatically applied. Finally, you should download and run the unofficial Rollcage Stage II Bump Map Fix. This fixes some graphical glitches in the game. Visit this page and download the patch, then simply run it to apply it automatically. Windows Smartscreen may caution you against running the file, but that’s just common practise for lesser-known executable files these days. Windows 7 users can now go right ahead and run the game (we’ll get to Windows 8 users in a moment). To start the game, make sure the CD-ROM is in your PCs optical drive and run “Rollcage Stage II (Direct 3D)” from the Start menu. The window shown below should then appear. Under “Device / Resolution”, check that “Primary Display Driver” is selected at the top. In the box below, select the resolution to run the game at. Generally you can choose the highest possible if your display supports it. Make sure to select a mode with “32 bits per pixel too”. 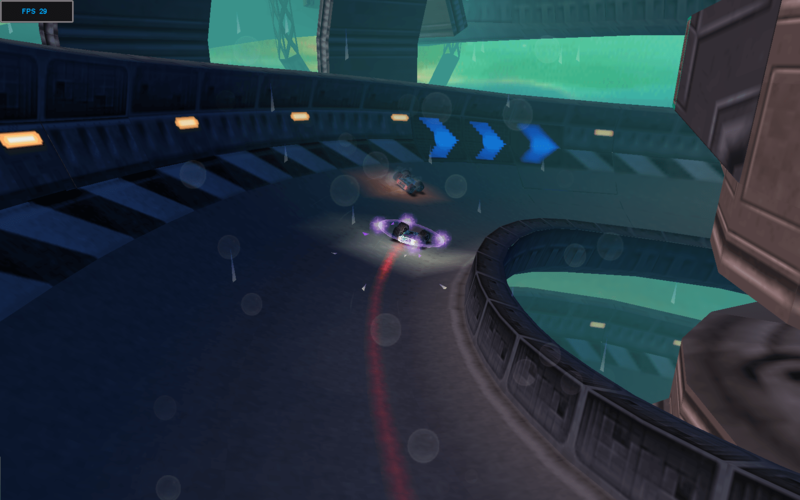 Rollcage Stage 2 is a 4:3 aspect ratio game and so may appear stretched if you force it into a widescreen aspect ratio. We also recommend selecting the “Triple Display Buffer” option. When you have configured these settings, click on “Play”. The game should now load without any difficulties. Before you get stuck in, there are several other options you may wish to configure, so move on to the “Tweaking visual options” section. 1) Use the Glide version of the game with a Glide wrapper – Glide wrappers are special software that translate the now obsolete 3DFX Glide software into OpenGL, a standard that modern graphics cards can understand. We tested the game with our favourite Glide wrapper nGlide and found it worked perfectly. You can download nGlide here. Once you have installed it, simply start Rollcage Stage 2 by running “Rollcage Stage II (Glide)” from the Start screen or Start menu. Configure the resolution the same way as described above. While we haven’t done an exhaustive comparison, playing the game in Glide mode should yield the same or very similar visual quality to playing it in Direct 3D mode. 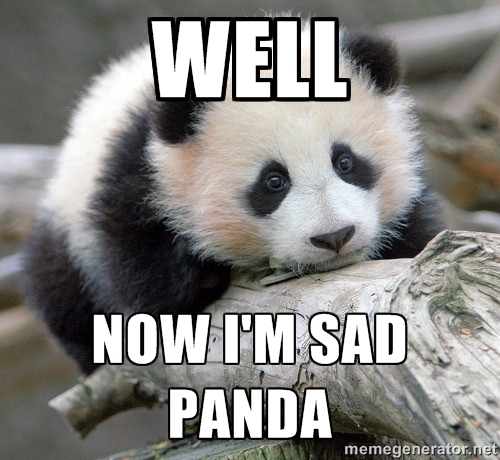 The disadvantage here is that Xfire will no longer work with the game. If you’re trying to organise a multiplayer match, having access to Xfire to chat to your friends is pretty much essential, trying to alt-tab from the game back to the desktop will almost always crash the game. 2) Use the replacement DDRAW.dll as used to fix framerate issues in other games – To use this fix, simply download the zip file here. Once the zip file has downloaded, open it up. Inside the zip file there are two folders, Windows 8 and Windows 8.1. Open whichever folder matches the version of Windows you are running (presumably 8.1 for the majority of people as there’s not much reason to still be on Windows 8). Inside the folder is a file called “DDRAW.dll”. Copy this file to the BIN sub-folder within the Rollcage Stage II game folder. By default it is in C:\Program Files (x86)\Psygnosis\Rollcage Stage II\BIN. That’s it, you can now run the game at 30 frames per second. Since this is a specific fix for these kinds of games, do NOT be tempted to overwrite any other copies of DDRAW.dll you may find elsewhere on your computer. To read more about what this fix does and why, see this link. 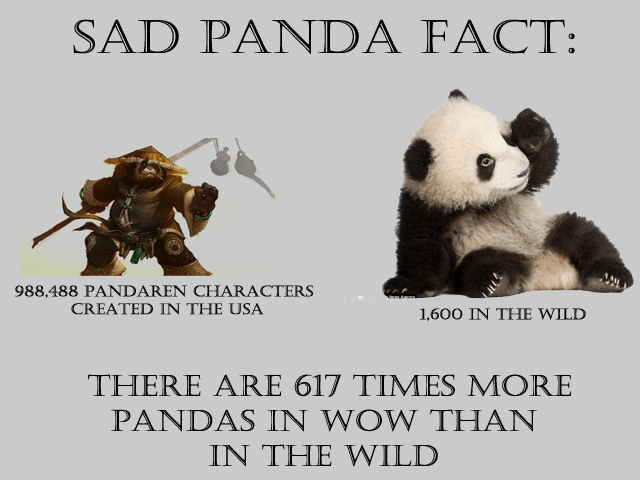 The disadvantage of this method is that none of the in-game videos will play any more. Instead of seeing a cinematic, you will get a black screen with sound. You can skip over the faulty videos by pressing the escape key. You can install and use both fixes/workarounds if you like, for instance you can use Direct3D mode when you play multiplayer and Glide mode when you play single player, the two fixes do not conflict with one another. General Brightness – This slider should be set according to taste. Not too bright else you will lose detail in brighter parts of the image. Transparency Density – We’re not completely sure what this does, so leave it at the default. Sound options can be configured by going to the Options menu and choosing Audio. On this menu, you should increase “Active Channels” to 20 and ensure “Sound Quality” is set to “Software – High”. For those of you with sound cards that support Creative ALchemy or similar technologies, it is possible to enable hardware audio if you configure the appropriate software, but there doesn’t seem to be any difference in sound quality by doing this. Getting modern controllers to work with the game is by far and away the most difficult part of playing this game on a modern machine. Try as you might, the game simply will not let you configure a 360 gamepad correctly. Axis on the controller are switched or inverted and playing the game is impossible. 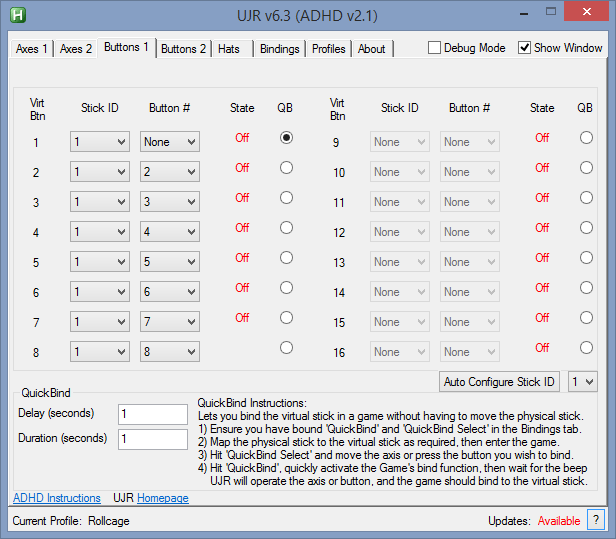 If you want a quick fix, you could use Xpadder and simply map the games keyboard commands to the pad. This will work, but Rollcage always supported analogue controls. To completely fix the issue, we are going to need xPadder as well as the vJoy and UJR tools. First of all, let’s set up Xpadder. 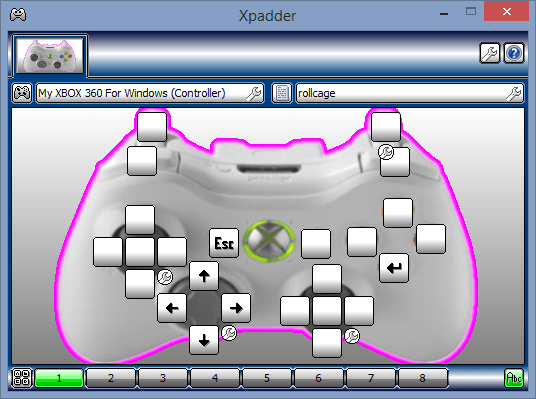 The picture below shows our Xpadder profile. By mapping the arrow keys to the 360’s d-pad, we can navigate the menus in the game without having to reach over to our keyboard. The Escape key is mapped to the back button, allowing us to skip cutscenes and go back up from a menu. Finally, the enter button is mapped to the A button, allowing us to select a menu option. 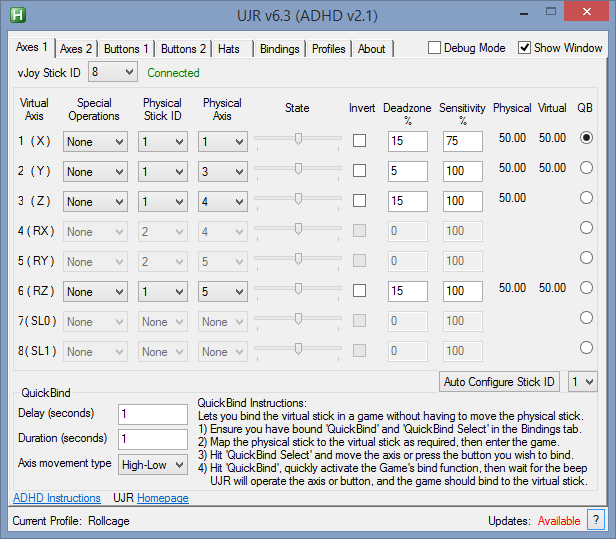 With xPadder configured, the next step is to set up UJR to remap some axis. If you have not used vJoy and UJR before, follow this tutorial to set them up. Naturally, you may need to change vJoy stick ID and Physical Stick ID depending on your system. In our configuration we’ve used the analogue triggers (physical axis 3) for acceleration and braking. On the original game (for the Playstation console) these controls were mapped to the face buttons instead, so feel free to reconfigure this if you desire. Notice that the first button is disabled, this is because Xpadder is handling this button so that we can navigate the menus. With all that configured, start the game again. Go into the Options menu and select “Controllers”. You should now be able to select “vJoy device” as your joystick and map the buttons accordingly. The 360 pad should now work perfectly. Other analogue controllers should also work with a little more tweaking. The disadvantage of this method is that it may interfere with the controller mappings in other games, you may need to disable the virtual joystick in device manager if that happens. No music in-game – The Rollcage Stage 2 CD-ROM must be placed in the CD/DVD drive on your machine that has the first drive letter. If you have more than one (this includes any virtual CD/DVD drives you might have as part of a CD/DVD recording suite), make sure to use the drive that comes first alphabetically. For instance if your optical drives are D: and F: you must run Rollcage Stage 2 from drive D: if you want to hear the in-game music. If you need to change the drive letters of your optical drives, see this tutorial. Poor/low frame rates – If you are running on Windows 8, make sure you followed the Windows 8 specific steps under “Running the Game”. Problems saving games or settings – Rollcage Stage 2 places its save game files and settings into a file called “Configuration Data” that resides in the IDXData sub-folder within the Rollcage Stage 2 game folder. This can cause problems on more modern versions of Windows as programs are not normally permitted to write to the program files directory. To avoid this problem, either install the game to an alternate location (e.g c:\Games\Rollcage2) or manually edit the permissions on the IDXData folder. If you installed the game to the default location, the folder can be found under “C:\Program Files (x86)\Psygnosis\Rollcage Stage II\IDXData”. A tutorial on how to edit folder permissions can be found here. 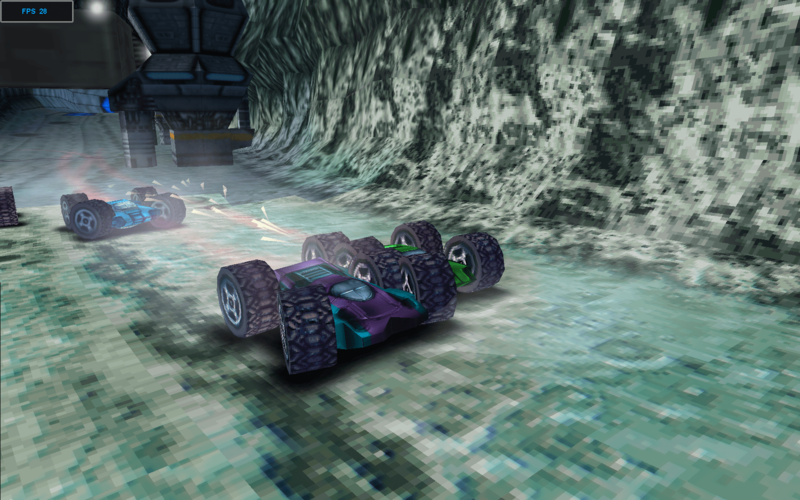 Rollcage Stage 2 on the PC did support online multiplayer, however the servers that facilitated this are long gone. Nevertheless, a league of dedicated players still regularly run multiplayer matches. We ran a short article about this league and you can find out more by clicking here. Split screen multiplayer is also possible, if you’re prepared to jump through those hoops to get an additional controller working! The popular gaming utility Xfire supports Rollcage Stage 2, allowing you to take screenshots, videos, surf the web and track your friends all while playing the game. This is particularly useful since the game usually crashes or glitches out if you try to alt-tab out of it to quickly check your e-mail, for instance. By putting the Rollcage Stage 2 CD-ROM into a CD player or by using a CD audio player on your PC, you can listen to the games soundtrack. You may add that there’s a fix for bump maps that may appear broken on your computer (see the screenhot here : http://indigo176.blinkenshell.org/rollcage/before.jpeg). That’s great, thank you I have updated the article. I actually saw that bug while testing but thought it was intentional, like a kind of Michael Jackson’s Billie Jean effect on the road or something, lol. Oh and I just noticed Codemonkey’s Rollcage Redux patches for the first game, exciting stuff! I will take a look at those as soon as possible. Awesome, thanks! I’ve just updated the Rollcage 1 page with the information on the awesome Redux patch. Does anyone know how to delete their save files on this game because one time I had a friend over and we used cheats to unlock all the cars and tracks so one of us wouldn’t have to go through the whole game just to have everything but now I want to delete the save and start a new file. As stated above, Rollcage Stage 2 places its save game files and settings into a file called “Configuration Data” that resides in the IDXData sub-folder within the Rollcage Stage 2 game folder. Oh I didn’t even notice, anyway thanks a ton! The keys “DataPC” & “DataPSX” are the savegame, export them to keep your savedata. Or delete the to reset. It depends if you’re using the original games, or the Redux/Extreme version I think. I will check it out tonight. I cannot seem to go over 1280×720. Is this an issue for anyone else? PS. Game runs great at 720p… no complaints at all. Comment: I found that it installed fine until I opened the menu and only multiplayer networks is available. I followed all the instructions and installed both patches before opening the game. To my dismay “1 Player Games” is greyed out. Please tell me there is a simple fix for this? I’ve been aching to play this game for so long, only to be denied by a menu option. 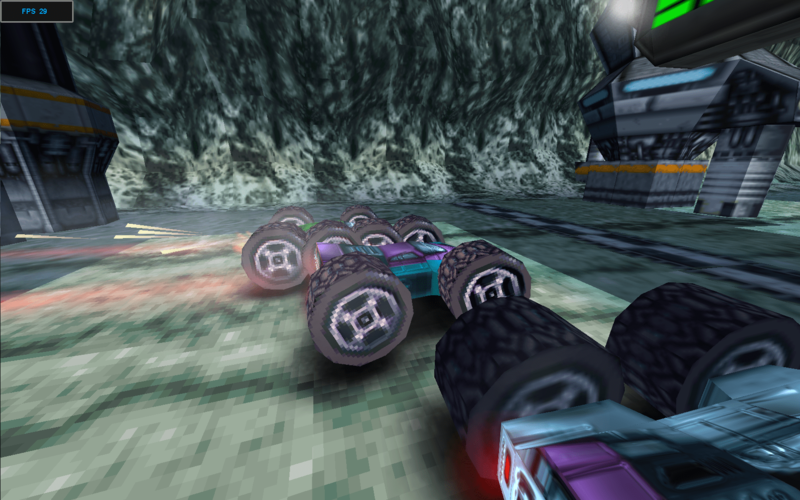 You should check out Rollcage Redux and Rollcage Extreme, which are recently-patched versions of Rollcage and Rollcage Stage 2. This article doesn’t help in the least. I have a Win10 machine and neither rollcage game will install. The autorun doesn’t even work, and when I hit the setup icon the drive spins for a few seconds, I get splash window asking me if it’s okay to install and alter my system, and then nothing when I click yet. Sounds like there’s some other software on your PC conflicting with the installer program. Yeah I really need to update this article with that. My other site keeps me too busy lately.